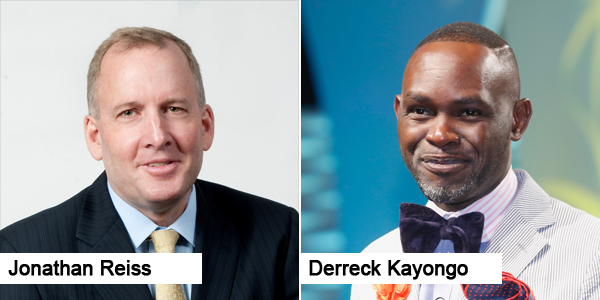 Human rights visionary Derreck Kayongo and insurance industry leader Jonathan Reiss will be spotlight speakers at this year’s Bermuda Captive Conference, scheduled to run June 11–13 at Fairmont Southampton. Both will address the three-day conference, Bermuda’s largest and longest-running industry event, now in its 14th year. Now returning to its regular spring slot after last year’s September event following the America’s Cup, the conference attracts about 800 delegates annually. Half that number are usually attendees from overseas, including captive insurance owners, risk managers, sponsors, and vendors from the United States, Canada, Latin America, and the United Kingdom. “We’re delighted to be able to announce this year’s key speakers, who we know will attract and engage audiences,” said Michael Parrish, Chairman for Bermuda Captive Conference 2018. Uganda-born Kayongo is CEO of the Center for Civil and Human Rights in Atlanta, GA, and founder of the Global Soap Project, an initiative that recycles used hotel soap and redistributes it to impoverished populations around the world. A Top Ten CNN Hero in 2011, he talks about his journey from refugee to successful entrepreneur and renowned human-rights activist. “It’s an honour to be invited to the Bermuda Captive Conference, especially in a year when the theme of diversity is being discussed and celebrated at this event,” said Kayongo. Bermudian Jonathan Reiss is Group CFO for Hamilton Insurance Group, a position he’s held since Hamilton’s formation in December 2013, and is a member of Hamilton’s founding management team. In addition to his responsibilities as CFO, he also has executive oversight for the Company’s Human Resources function and is the Executive Sponsor of the Company’s Diversity & Inclusion initiative. The Bermuda Business Development Agency [BDA] is working closely with captive insurance industry groups and conference organisers to support the legacy event. Among other updates, the conference website and marketing have been given a brand refresh; an event app will allow delegates to connect via instant messaging; new social events have been created for visitors who bring family members to the island; and a gala dinner will wrap the conference at a new venue, historic Commissioner’s House, at the Royal Naval Dockyard. “This is the fourth year of our strong partnership with the BCC,” noted BDA Business Development Manager and conference Marketing Chair Jereme Ramsay. Parrish said the conference would feature heightened community outreach this year—with a local non-profit to be selected as a donation beneficiary and educational elements added. “Bermuda remains the world leader in the captive insurance industry, with close to 800 active captive licences on its register, supporting primarily Fortune 500 corporations in the US, and generating over $55 billion in annual gross written premiums,” the BDA said. “A study conducted by PriceWaterhouseCoopers for BIMA last year found the captive insurance industry contributed an estimated $174 million annually to the island’s economy and directly employed at least 557 people. “The BDA and industry stakeholders will promote the conference at numerous events over the next few months. These include the World Captive Forum in Ft. Lauderdale, FL January 31–February 2; the Captive Insurance Companies Association [CICA] international conference in Scottsdale, AZ March 11–13; the International Cyber Risk Management Conference in Toronto, ON April 11–12; and the RIMS 2018 conference in San Antonio, TX April 15–18, the insurance industry’s largest annual event, where Bermuda’s booth will sport photographic wrap advertising the captive conference to build interest and boost registrations.